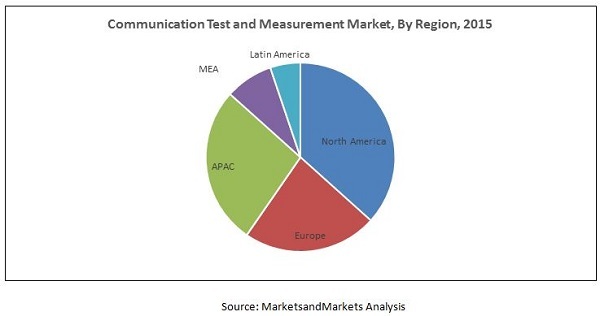 The report "Communication Test and Measurement Market by Test Solutions (Wireless, Wireline), Type of Test (Enterprise Test, Field Network Test, Lab and Manufacturing Test, Network Assurance Test), Services, End-User, Region - Global Forecast to 2020", defines and segments the communication test and measurement market into various sub-segments with an in-depth analysis and forecasting of market sizes. Browse 69 market data tables with 73 figures across 167 pages and in-depth TOC on “Communication Test and Measurement Market - Global Forecast to 2020"
The market is estimated to grow from USD 4.28 Billion in 2015 to USD 6.69 Billion by 2020, at an estimated compound annual growth rate (CAGR) of 9.3% from 2015 to 2020. Communication test and measurement instruments allow evaluation of the performance and quality of communication devices and networks so that the highest level of customer satisfaction can be achieved. Rising demand for faster and reliable communication technologies are the driving forces of communication test and measurement market. Augmented smart phone adoption, high mobility and explosive mobile data traffic growth have sparked a revolution in the wireless communication sector. The rapid change in the network circulation from voice to integrated voice, video, and data is encouraging the need for solutions to test performance, capacity, and network management for data traffic. Various cellular technologies from 2nd generation (2G) to 4th generation (4G) - GSM/GPRS/EGPRS, TD-SCDMA/HSPA, CDMA2000, LTE and LTE-Advanced (LTE-A) and wired communication technologies, such as Ethernet and Fiber Optics, providing up to 100Gbps speed, are mainly driving the communication test and measurement market presently. Research and development in 5th generation (5G) has also been initiated which will provide data transmission at a speed higher than that of LTE-A. Similarly, Ethernet and Fiber Optics are evolving to achieve speed up to 400Gbps and above. The recently introduced and future communication technologies are expected to drive the communication test and measurement market in next five years. Moreover, rising demand for Internet of Things (IoT) based projects are also a major driving factor of the communication test and measurement market. This market is in the growth stage in Asia-Pacific (APAC), Europe, Middle East and Africa (MEA), and Latin America, as communication technologies in these regions have immense scope for enhancement. Moreover, there is huge return on investment in the communication test and measurement market as opportunities for augmented performance are always increasing, hence communication specialists and leaders continue to visualize more effectively about the need for communication test and measurement solutions and services across all the regions. The major vendors in the communication test and measurement market include Anritsu, Agilent Technologies, Danaher, EXFO, Ixia, National Instruments, Rohde&Schwarz, Spirent Communications, Yokogawa Electric, and Viavi Solutions. A detailed analysis on key industry players is done to provide insights about their businesses, products and services, key strategies, and recent developments associated with the communication test and measurement market. The communication test and measurement market has been segmented into test solutions, types of test, services, end-users, and regions. The communication test and measurement solutions are further segmented into wireless and wireline test solutions. The types of test are enterprise test, field network test, lab and manufacturing test, and network assurance test. Services are further classified into product support services, professional services and managed services. End-users are segmented into network equipment manufacturers, mobile device manufacturers, telecommunication service providers, and enterprises. Furthermore, the report classifies the market according to the regions of North America, Europe, APAC, MEA, and Latin America.